At night from July 2 to July 3 the redocking of the SoyuzTMA-14 spacecraft was performed. The spacecraft was undocked from the docking port of the Zvezda module and was docked to the docking port of the Pirs module. On July 2 at 21.29 UTC SoyuzTMA-14 with the cosmonauts Gennadiy Padalka, Michael Barrat, Koichi Wakata on board undocked from the ISS moved away from the station at the distance of 30 metres and at 21.55 UTC docked to the ISS again. The other members of Expedition 20 crew cosmonauts Romanenko, De Winne and Thirsk were aboard the station during the redocking of the SoyuzTMA-14. TerreStar 1 - the heaviest telecommunications satellite ever launched. A Music Satellite is in orbit. On June 30, 2009 at 23.15 (Moscow time) the "Sirius FM5” satellite was launched from Baykonur Cosmodrome. The satellite was delivered to orbit by the "Proton-M” Russian rocket-carrier equipped with the "Breeze-M” booster (upper stage). The Sirius FM5 mission is the 5th Proton launch of 2009 and the 346th Proton flight overall. Sirius FM5 is a Communications Satellite. It is a new high-EIRP geostationary satellite launched for Sirius Satellite Radio Inc. It will join the company’s three satellites that broadcast 100% commercial-free music, plus sports, news, talk, entertainment, traffic, weather and data over the United States. Memorial Museum of Astronautics in Moscow. 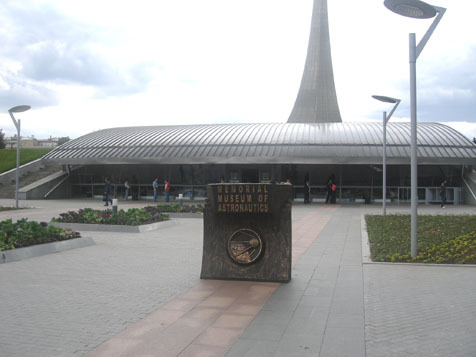 In April in Moscow the Memorial Museum of Astronautics was opened after a long reconstruction. It was closed for repairing in 2006. The square of the renovated museum was enlarged in 4 times and now it is about 8 000 square metres. Now there are a lot of new exhibits here. In the museum there is a cinema, a conference hall, a picture gallery, children and youth club of aerospace education, the club of the veterans of cosmonautic, a café. Visitors can enter a full-size copy of the base block of the Mir space station. We recommend visiting the museum. It is situated near VDNH metro station. To see more fotos, click here!!! BULGARIA 2009 European Philatelic Exhibition. Kosmos-2451 satellite is in orbit. On May 22, 2009 at 01.53 Moscow time the “Soyuz-2” rocket-carrier equipped with the “Frigate” booster was launched from Russian Plesetsk Cosmodrome to orbit the Russian military satellite of the ‘Meridian” type. Having been orbited, the satellite was officially named as the “Kosmos-2451”.